Looking for a loyal and fluffy dog? However, have you ever considered a Golden Chow? This might just be one of the best choices from all the puppies and dogs available for you. These protective but gentle dogs are fantastic companions, but they are not the dog for everyone. In this article, we will take a look at this remarkable mixed-breed dog. We'll help you understand their appearance, temperament, and exercise and training needs. By the end, you'll have a better understanding of whether this mixed-breed dog or hybrid is good for you. 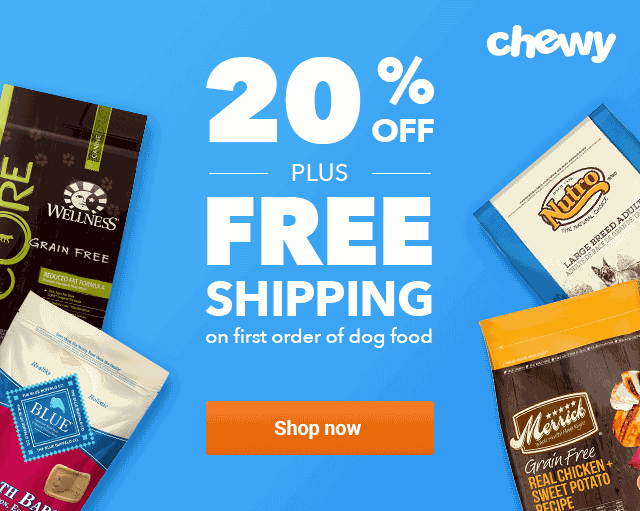 What Is a Golden Chow? 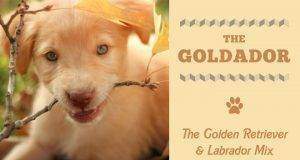 How Does a Golden Retriever Chow Mix Compare to a Purebred Golden Retriever? Should I Get a Golden Chow? A Golden Chow, also known as the Chow-Golden Retriever, is a hybrid of a Golden Retriever and a Chow Chow. It is an attempt to take the best of two wonderful dogs. The history of the Chow Chow Golden Retriever mix is not well known. They have only emerged in the last 20 years as part of a growing trend to cross breed different purebred dogs. As such, it is generally considered a "designer" dog. Some of these cross-breeds have been successful. The Labradoodle is a classic example. The hybrid is now standardized, meaning that owners know what they are getting when they buy one. The Golden Chow has not got that far. The appearance and temperament of the dog can vary depending on the parents. The first parent breed of this mix is the Chow Chow. The Chinese developed this dog more than 2,000 years ago as an all-around working animal. They served as farm animals, temple guards, and even army dogs! Many people are wary of the Chow Chow. It is known for being aggressive and standoffish. Some insurance companies will even increase your rates if they know that you have one of these as a pet. Without proper socializing, this dog can be mean and scary. It's not the best animal to have around small children. Some famous Chow Chow lovers include Sigmund Freud, Elvis Presley, and Calvin Coolidge. Martha Stewart is also a fan and owns three. Their names are Empress Chin, Peluche, and Genghis Khan. The other half of the equation is a lovable Golden Retriever. This breed is young compared to the Chow Chow. These dogs were developed in Scotland as hunting companions. 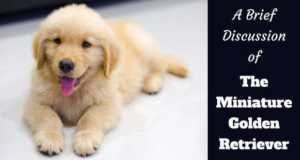 Golden Retrievers are one of the most popular family dogs out there. 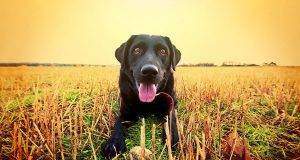 This is because they are obedient, affectionate, and easy to train. 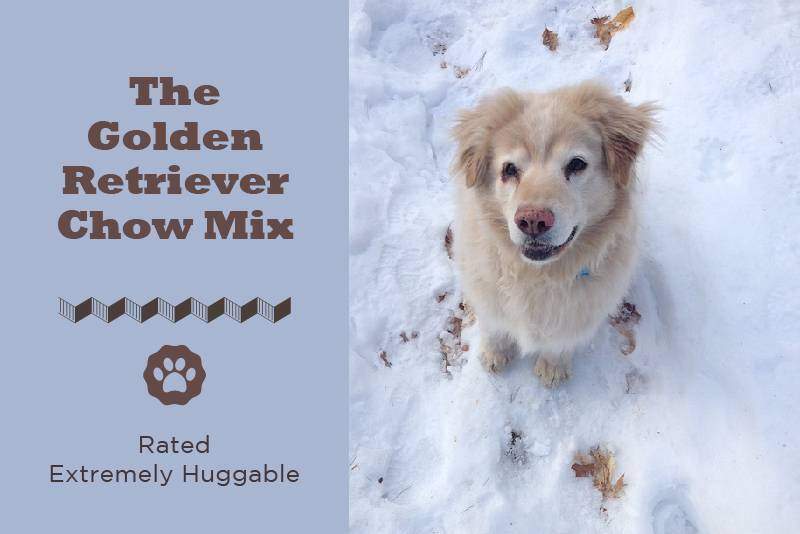 The Golden Retriever Chow mix tries to capture the loyalty of the Chow Chow and the affability of the Golden. They are known for being fluffy, aloof, and devoted pets. Golden Chows can be very similar to Golden Retrievers—or they could be very different. The answer depends largely on your individual dog and its genetics. As a hybrid, this dog tends to lean one way or the other. This is true for both appearance and temperament. Chow Chows usually weigh in at about 50 to 75 pounds and will stand 20 to 25 inches tall. They are considered medium-sized dogs, but they are at the larger end of the scale. Both the Golden and the Chow Chow are somewhat big dogs, so this cross is no small pup. Chow Chows can have a variety of appearances. Some will look like fluffier Golden Retrievers. Others might look like thinner Chow Chows. No matter what, you can expect a thick double coat that will need daily brushing. It will generally be more of a red or gold color, but this is not always the case. An interesting characteristic that you might find in your dog is its tongue. Chow Chows are known for their blue-black tongues, and it looks like this is a dominant trait. Your dog might have a splotchy multi-colored tongue. The mouth will also probably be darker as well. 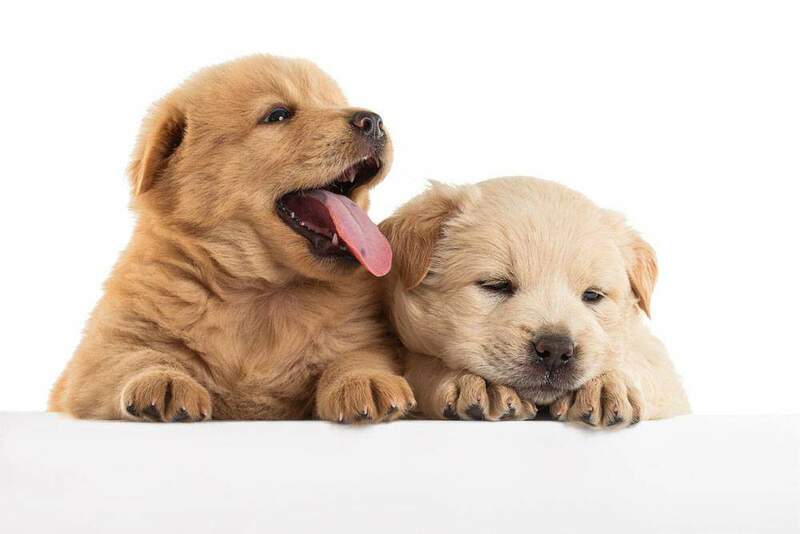 But lest that discourage you, check out this video of super adorable Golden Chow puppies. You're welcome! Temperament is where these dogs differ most from a Golden Retriever. This is because the two parent breeds are very different. Goldens love affection of all kinds, including from strangers. Chows are wary of people in general and are protective of their homes. 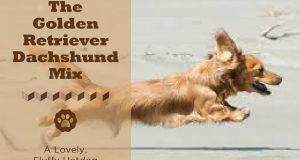 If your dog leans more towards a Golden, it will be an attention-seeker. It will also be friendlier towards strangers. 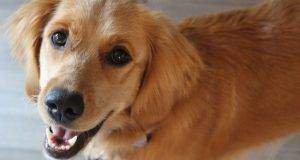 It will have many of the lovable traits that you look for in a Golden but might be more reserved and relaxed. 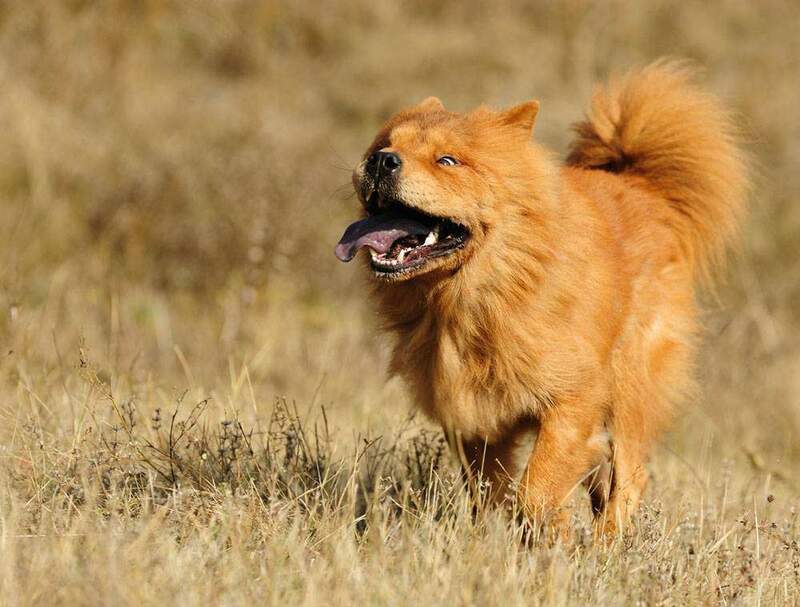 A Golden Chow that leans more toward Chow traits, however, will not be as friendly. These dogs will be more protective of their homes and are suspicious of anyone who enters. Should I Get a Golden Retriever Chow Mix Puppy? If you are considering a Golden Chow, you should be prepared to change your lifestyle. These dogs will take up a lot of your time and energy when it comes to training and exercise. Ultimately, your dog's needs are going to be dependent on their genetics. If they are more of a Golden Retriever, they will be easy to train. Goldens live to please people, and they are naturally obedient. They are focused to the point of obsession and will work hard to achieve any task that you give them. Goldens are also extremely active dogs. As hunting companions, they were bred to be outside and running around for long periods of time. Their favorite game in the world is fetch, especially if you throw a stick or ball into a lake or ocean. If your dog is more of a Chow Chow, training will be more difficult. You will need to establish yourself as the alpha dog right away. Chow Chows typically require more discipline than other dogs. This should never be physical though. Instead, give your dog a stern "no" and ignore it until it is ready to listen. You won't know which way your dog leans for a few weeks so try a mixture of techniques. You will likely find a unique training program that works for your dog. It is important to socialize Chow Chows and Golden Chows from an early age. The Chow side needs to learn that other animals and people do not pose a threat. The Golden Chow is only recommended to experienced dog owners. It also is not a dog for families with young children. The Golden Chow is a difficult dog to raise. However, the reward is a sweet, loyal, and protective dog that will keep your family safe. Already Have a Golden Chow? Make sure you feed them with food that's appropriate for them. Check out our feeding guide here.